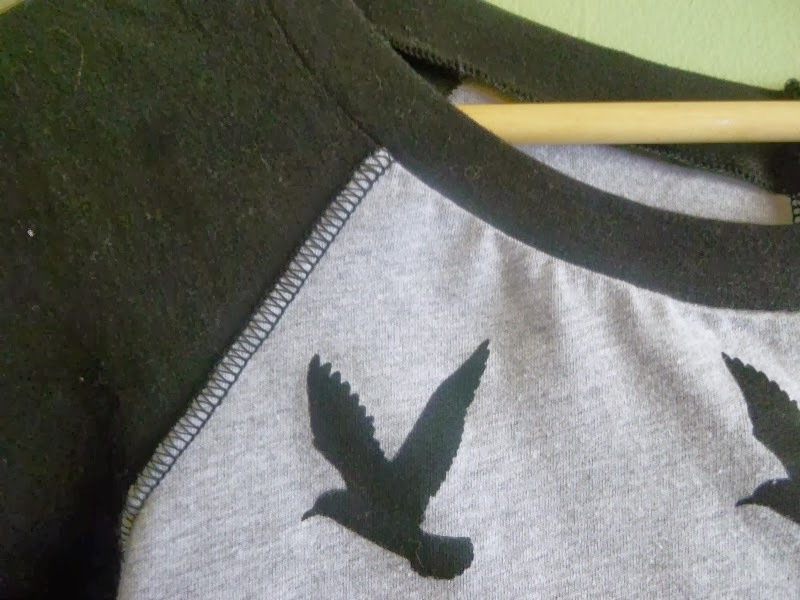 The birds on this shirt make me want to fly outta this cold weather. Today makes day FIVE in a row that I haven't left my house, although I plan to try today. The temperatures are finally coming back up, but the roads are still bad. 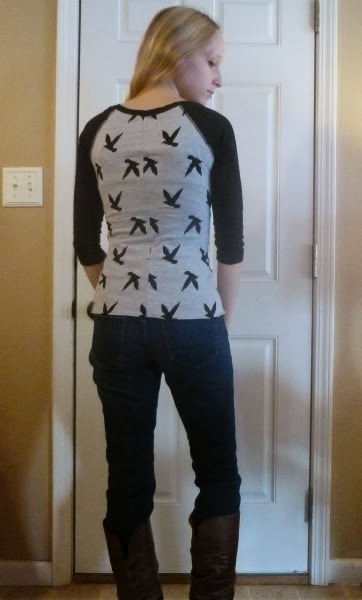 I've been sitting at home and sewing, and I finally sewed up this bird silhouette fabric that I ordered (from Girl Charlee), oh, close to a year ago? Two? IDK. The black is cotton/spandex jersey, also from GC. I loved this fabric when it was released (didn't everyone?) but I fell victim to "it's TOO special I can't sew it" mania. Being stuck at home forced me to GET OVER IT and stop wasting time stashing fabrics. Sew it already! The pattern is Simplicity 1501. 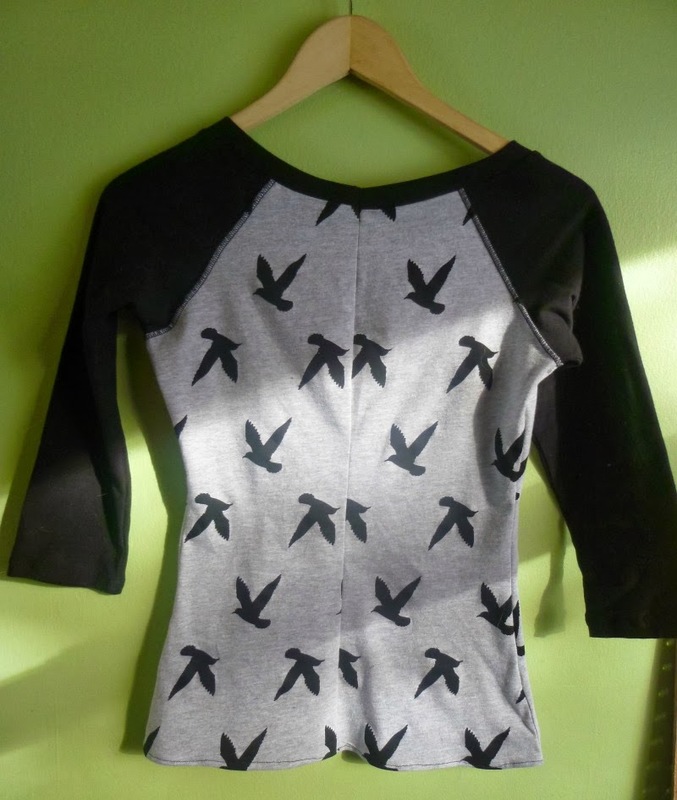 This is a new pattern and I bought it right away, on my quest for more raglan-sleeve styles. I'm also looking forward to making some of the shorts come summertime. 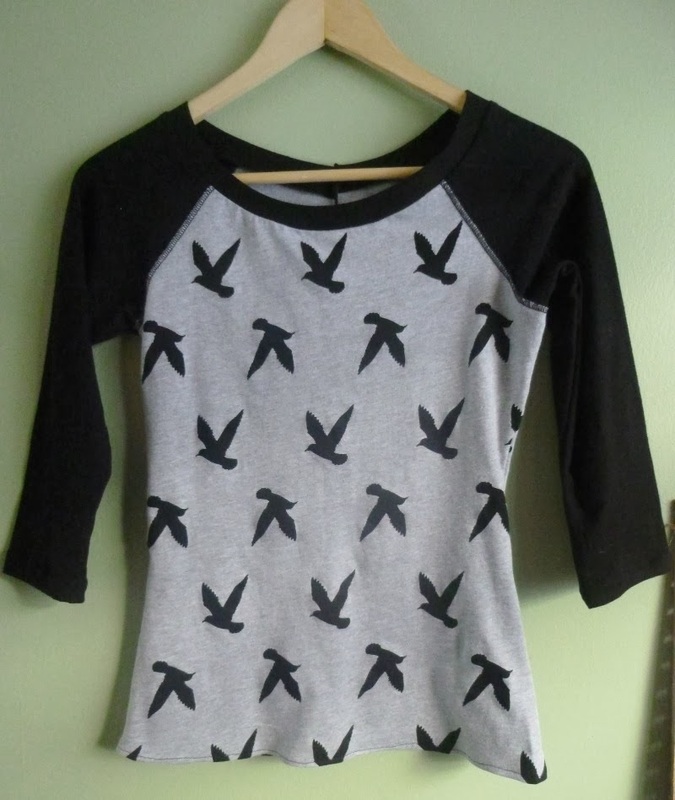 Yes, I made a different raglan t-shirt a few months ago (here) but I wasn't in love with that pattern. There were too many things I needed to change (armholes/sleeves too tight, neckline too low, shoulders too broad), so I figured $1 on this Simplicity pattern was worth a shot. I sewed a size XXS, but I extended the side seam/hem line to the length of the XXL. As drafted, this pattern is SHORT. It called for a 1" hem but mine is more like 1/2". It's still too short for my personal taste (although it looks pretty good in these photos). Next time I'll add 2" at the lengthen/shorten lines and be more comfortable with a 1" hem. I used 1/2" seam allowances throughout, instead of 5/8". This decision was based on fitting-as-you-go and also on the fact that I was using my serger. And speaking of sergers, I tried something new! 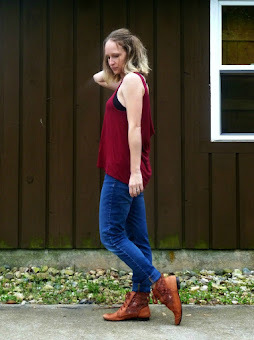 I used a flatlock stitch to sew the sleeves to the bodice. I love how RTW it looks, and it was SO simple. I was changing thread color on my Brother 1034d anyway, so I followed my manual for the appropriate settings for flatlocking. I did a few tests and was pleased enough to do it on the shirt. To achieve this look, I sewed with the pieces WRONG sides together. 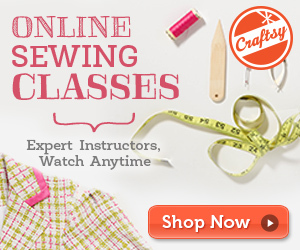 You can also use the flatlock stitch to have "ladders" if you sew RIGHT sides together. I liked the look of the loops better than the ladders for this particular shirt. Wrong side of flatlocked seam. 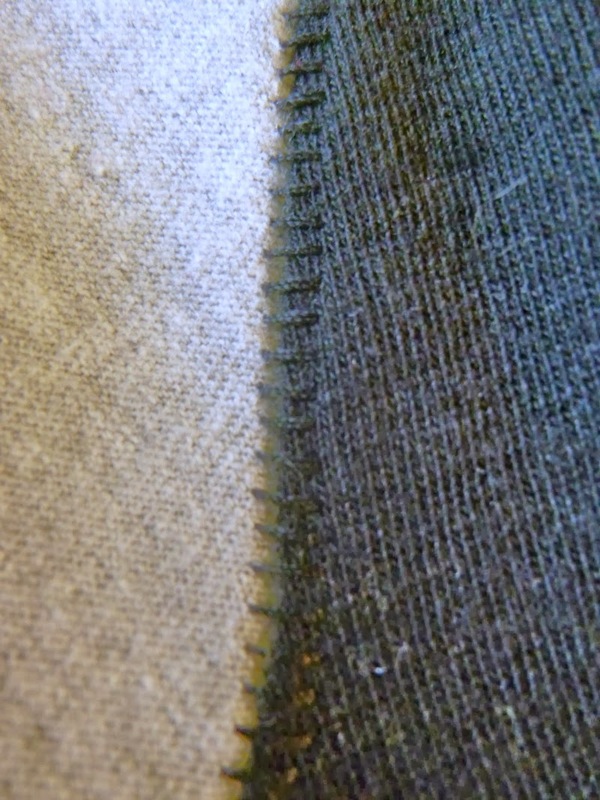 Overexposed to show ladder stitches. One final pattern adjustment. 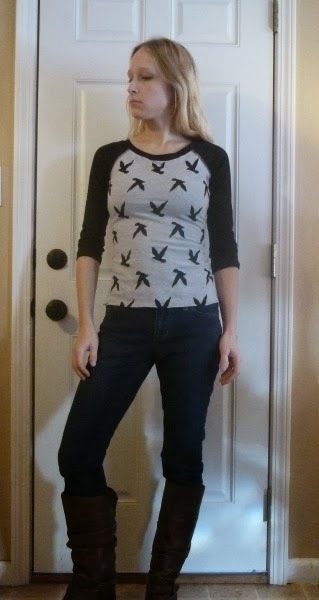 Unlike my previous raglan t-shirt, this pattern has a center-back seam. That allowed me to easily adjust for narrow shoulders (which I'm finding is a required adjustment for me). After removing a wedge at center-back (at the neckline) the shirt lies flat across my shoulders. No gaping! Very nice. 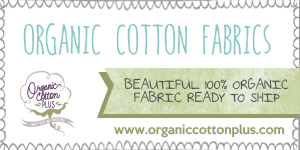 It is so great when you find the perfect tee shirt pattern for your body! Congrats on finding yours. 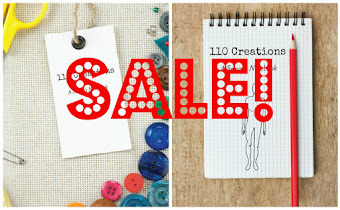 I came across your review @ PatternReview - getting ready to make this same pattern! I love your version. Thanks! It's a quick sew, I'm sure you'll like it. Wow! I love the fabic you picked it turned out great, I originally got the pattern for the shorts and didn't even notice that the shirt pattern came with it! I like the shorts too, though I still haven't made them yet!